Have you been looking for Polarized Sunglasses. Look no further friend and check out our new line of Blue Water Polarized Sunglasses. Here you will find something to meet your Polarized Sunglasses needs. Bold like the elements, cool as Ice and tough under fire. Check out Maximumeyewears new line of Blue Water Polarized Sunglasses flagship, the Barracuda. 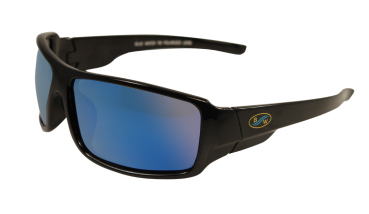 Featuring a Blue Revo Mirror Polarized lens and a wrap style frame these rippers will cut the glare of the sun off of the water, the snow or any reflective surfaces that threaten to marr you vision. So dont take any prisoners and no chances and look good while youre doing it be it fishing, Skiing, Hiking or just hanging at the lake. Featuring UV 400 Scratch Resistant Polarized lenses, bold square lines and durable construction and youre covered.